Economic growth in China may be the weakest in seven years, but the country's appetite for premium autos is bigger than ever. Mercedes Benz, which is owned by Daimler (DDAIF), just reported a 24% rise in sales in China in the first quarter. China became its biggest single market worldwide last year after sales soared 40%. "Over the past years, we've put a lot of effort into [research and development], designing and bringing the right products to China and this is paying off," said Hubertus Troska, the Daimler board member in charge of its China business. 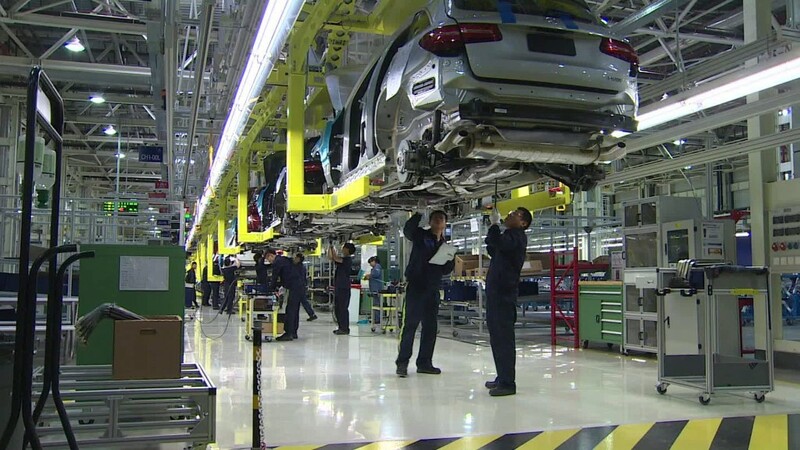 Mercedes' largest manufacturing plant in the world is in Beijing, not its German hometown of Stuttgart. Workers and robots at the Chinese factory churn out four different models of passenger car, including sedans and small SUVs. "Chinese consumers continue to have a major love affair with sports utility vehicles," said Namrita Chow, an automotive analyst for research firm IHS. They see them as safer and more roomy, she said, "and if they have a premium brand attached to them, even better." Mercedes began making cars in China later than its two big rivals, Audi -- owned by Volkswagen (VLKAY) -- and BMW (BAMXY). Producing vehicles locally enables foreign brands to bring down the cost and compete more effectively in the giant Chinese market. Mercedes is still lagging Audi and BMW in China, but its business is growing far more quickly. It started local production of another SUV model, the GLC, late last year. The company has also ramped up advertising and expanded its dealerships across the country to nearly 500, Troska said. It has just announced a new E-class, which will be made in China and is expected to hit the market later this year. Other big international automakers also want a larger slice of China's premium vehicle market, and they're setting out their stalls at the Beijing Auto Show this week. General Motors (GM)' Cadillac is showing off the XT5, an SUV crossover model that recently began production in China. And Nissan (NSANF)'s premium brand, Infiniti, is premiering its new SUV concept, the QX Sport Inspiration. Increasing competition and China's cooling economy mean Mercedes' sales aren't expected to keep expanding as dramatically as they did last year. A tax break on auto sales is also set to expire at the end of this year. "We all have to accept more moderate growth," Troska said. "But still, growth in China is far above what we see in Europe or other Western countries." The prospects look pretty healthy for the time being. IHS forecasts sales of premium SUVs in China will grow 10.6% to 900,000 units this year, reaching 1.3 million by 2020. "You've always got that strata of the growing middle class who are at the top end and will go for a premium brand," said Chow.